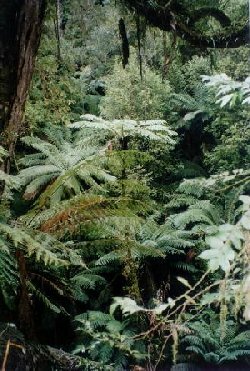 The section of rainforest at Merrimans Creek does not extend very far down the creek but is very wide, extending high up the slope on the eastern side. There is also a small section of old growth on the eastern edge of the rainforest. The western side of the creek was cleared for plantation purposes in late 1998 and no buffer was left for the rainforest. 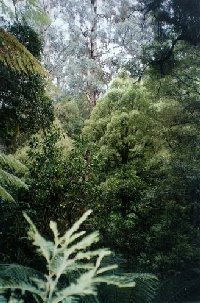 Rainforests in the Strzeleckis by Elaina Fraser. 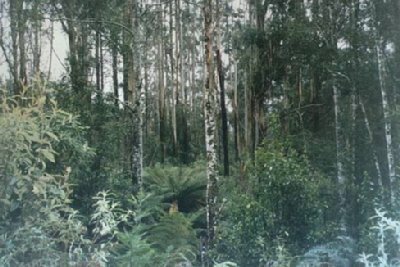 93-107a: Merriman's Creek Rainforest. June 1998. 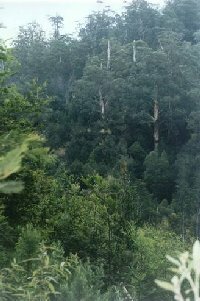 Logging right up to Cool Temperate Rainforest Buffer by Victorian Plantation Corporation. Hancock have since sacked the forester responsible for this blatant disregard for adequate protection of cool temperate rainforest. Note Myrtle Beech and Old Growth Ash in buffer. Buffer replanted with Shining Gum. 93-107d: July 2001. 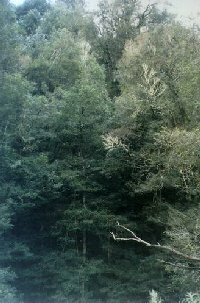 Inside Cool Temperate Rainforest with Merriman's Creek flowing at bottom of photo. Merrimans Creek supplies water to the town of Seaspray. 93-107h: July 2001 - Strzelecki Ranges. 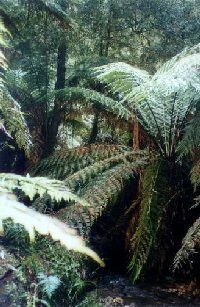 FFG listed Slender Tree Fern inside the Cool Temperate Rainforest of Merriman's Creek. 93-107I: July 2001. Old Growth Ash inside the Cool Temperate Rainforest dominated by Myrtle Beech and Sassafras. 93-107j: July 2001. 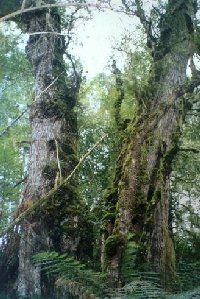 Two old Myrtle Beech trees inside Merriman's Creek Rainforest. 93-107k: July 2001. Inside the rainforest. Note old growth eucalypt in background. This area was privatised by the Kennett Government and sold to Hancock as plantation! 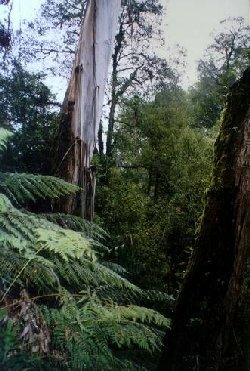 93-107m: July 2001: Possible Myrtle Wilt inside this Cool Temperate Rainforest. 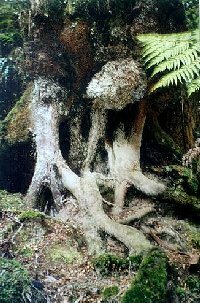 93-107n: July 2001: Ancient Myrtle Beech. Possibly centuries old in a forest that could date back 60 million years! 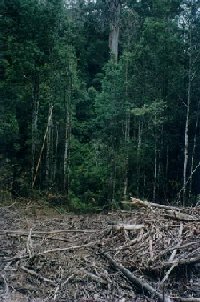 93-107o: July 2001 - Strzelecki Ranges: Long shot of cool temperate rainforest with old growth ash forest acting as a rainforest buffer on the western slope of Merriman's Creek. 93-107g: July 2001. Failed plantation. Note lack of plantation species with poor regeneration of Mountain Ash in background.